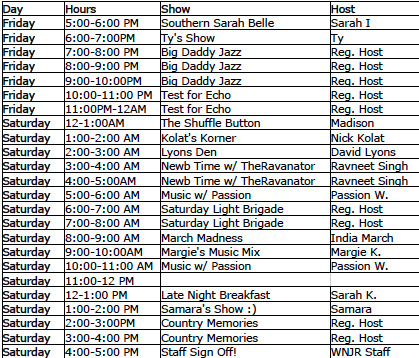 91.7 FM WNJR Washington / Pittsburgh : WNJR.org: 24 Hours of Live Radio! As the semester comes to a close, WNJR wanted to have one last hurrah! We are hosting 24 hours of live shows beginning today at 5PM until tomorrow at 5PM! We have many of our community hosts, student hosts, and staff members coming together to give you live programming with a variety of different music! Be sure to tune into 91.7 FM in your car, on the tune-in app, or go to www.wnjr.org>listen!